I was intrigued by a shop while walking to Plum Tucker, unbeknownst to me it was Botanica. The wide opened see through glass panel was showcasing beautiful bakeries and delicacies. After the brunch at Plum Tucker, I was tempted and walked into Botanica. Now checking their website, I just realised that all the sweets are gluten free. Maybe that is why they tasted different. Besides the sweets and some tarts, they do offer fresh salads, and I saw lots of people buying them! Ordering the sweets can be challenging because there were no tags or labels on them. I had to asked the staff member each of the desserts on offer. Thankfully, she was patient and happy to assist. 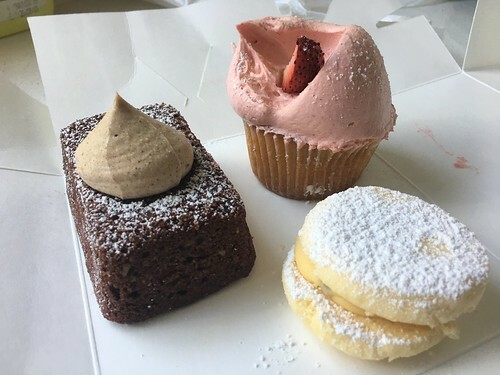 In the end, I bought a strawberry cupcake, a passionfruit melting moment and lastly, chocolate cake/brownie. I really enjoyed the melting moment which was crumbly and that is how I like them. The cupcake was delicious too but I could not make myself finish the icing. I thought the chocolate cake/brownie was all right. Anyhow, I could not wait to return to try their salads next time!